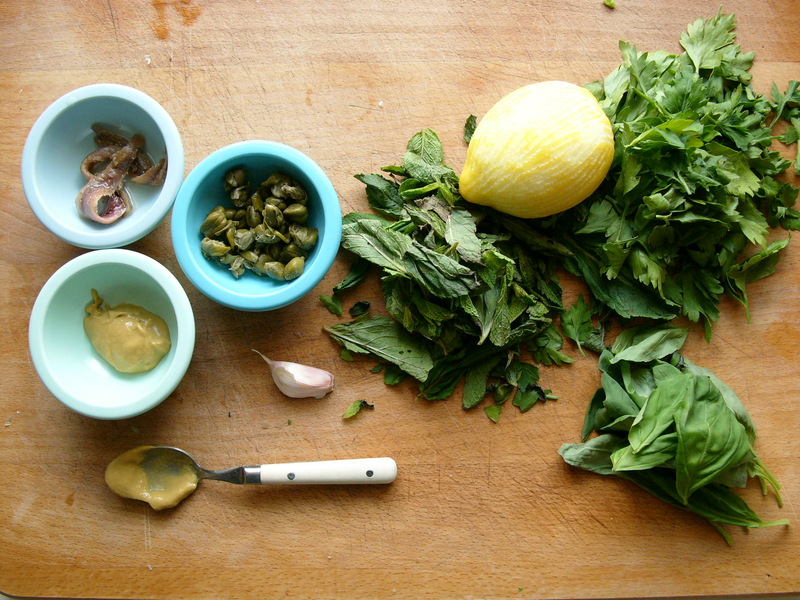 Salsa Verde (or how to use up the herbs in the bottom of the fridge…) | WTF Do I Eat Tonight? As the fridge-cleaning process enters day four, I am left with the herbs (basil and parsley, plus some mint I’d forgotten about), anchovies, capers, cherry tomatoes, eggs, halloumi, two packets of feta, black olives, two frozen chicken legs and a bunch of asparagus. I went off-piste a bit because I have had to buy another lemon (for the risotto), leaving me another half to use up, but I made stock with the bones of the ready-roasted chicken so whereas I spent on one I saved on the other. I wanted to make a chicken with feta dish; however, the herbs, which I bought at the weekend, are starting to look a bit limp so I need to use those up first. 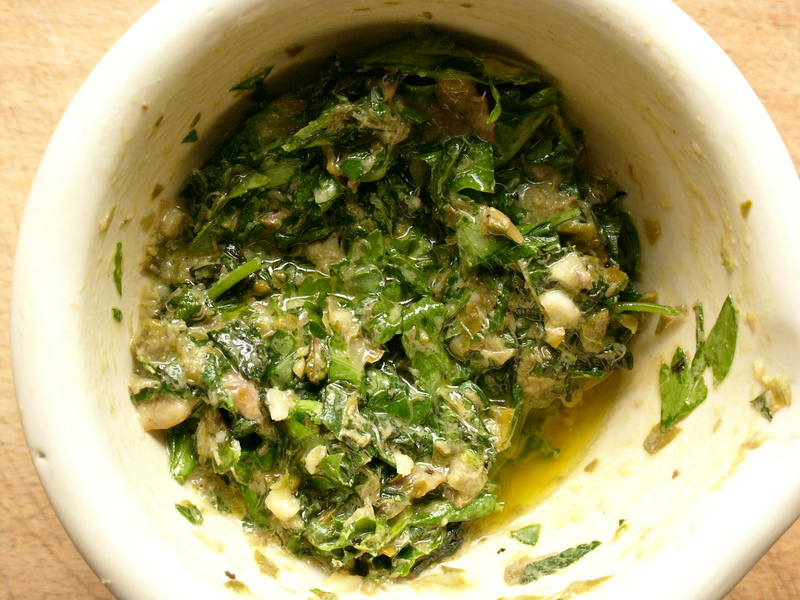 And salsa verde, I discover after a recce through my cookbooks, is the perfect solution, especially since I can throw in some anchovies, capers and that last half a lemon as well. I have never made it before but apparently it’s great with grilled fish and chicken. I had mint in the fridge so I used that with the basil and parsley but opinions differ on whether it’s necessary. So that’s tonight sorted. Shove a few chicken legs rubbed in olive oil in the oven, 180C for 35-45 minutes till brown on the outside and not the least bit pink on the inside (the timing will depend on your oven), some salsa verde and the last of my romaine for a salad. 1. Crush the garlic with the salt. 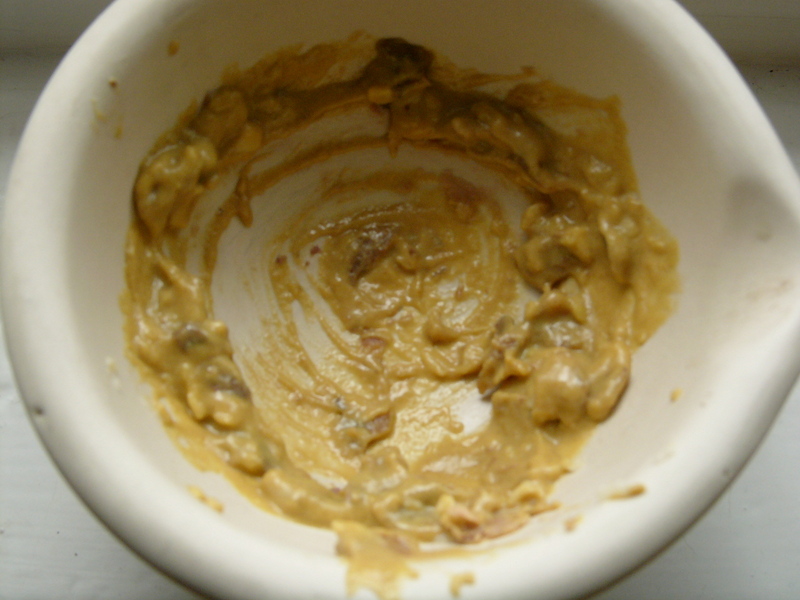 Mix in the mustard and anchovies to make a thick mustardy base. 2. Add the capers and the herbs and mix to a lumpy purée. 3. Stir in the lemon juice and olive oil (adjust the quantities according to both taste and whether you want a stickier or saucier consistency) and season. This entry was posted in Fast food fixes, Salsa and sauce recipes, Summer recipes and tagged salsa verde, sauce for chicken, sauce for fish, sauce recipes, summer recipes. Bookmark the permalink. I love this idea! I always have stray and past-their-best herbs living on various shelves of my fridge. I will do this, thank you. Thanks! A Bill Granger coriander salsa is coming up soon too; another perfect use-everything-up sauce.